Product prices and availability are accurate as of 2019-04-23 11:41:20 EDT and are subject to change. Any price and availability information displayed on http://www.amazon.com/ at the time of purchase will apply to the purchase of this product. Features. 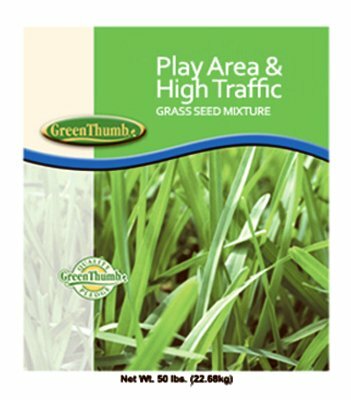 Play area high traffic grass seed. Mixture of the latest generations of turf type tall fescues kentucky bluegrass ryegrass. Coverage new lawns 16500 sq. Ft. Over seeding 33000 sq. Ft. Poly bag.. Dimension - 31.2 x 16.8 x 8.2 in.. Item weight - 50 lbs. Play area & high traffic grass seed Mixture of the latest generations of turf type tall fescues, kentucky bluegrass & ryegrass Coverage: new lawns = 16,500 sq. Ft. Over seeding = 33,000 sq. Ft. Poly bag. Dimension - 31.2 x 16.8 x 8.2 in. Item weight - 50 lbs.